View of “Paul Kneale: 4 or 5 self portraits for free-form natural language descriptions of image regions,” 2015. 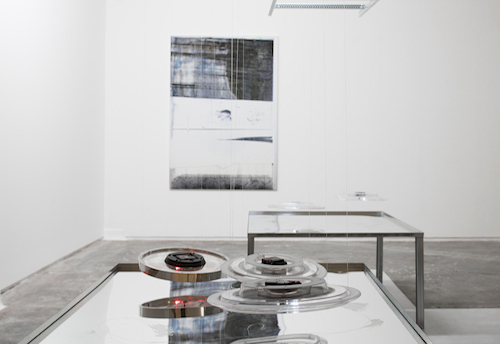 At the center of Paul Kneale’s latest solo exhibition is Quantum £1 shop I–V (all works 2015). Here, ten clocks are suspended facedown above five tables. The clocks’ hands have been replaced by LED microchips, whose lights bounce off the tabletops’ reflective surfaces. Between the blinking of the LED and its embedded technologies and the reflection from the tabletop, an image (previously shot by the artist) will be transmitted, scanned, and stored for digital printing. A piece made in this manner hangs in one corner of the gallery. Post-post-post production Skid Row is a large print of a blurry scan; facing it on the opposite wall are similar images, this time projected on the wall via a slide projector, in Post-post-post production. These works, which are richly indistinct, like a glitchy Gerhard Richter, will be passed on to Google, and the company will create automated text descriptions of them. Kneale’s previous solo show, “SEO & Co.” at tank.tv in London this past October, was a cacophony of inexact digital content. The artist compiled a script generated from YouTube keywords used for search-engine optimization to create five filmed performances that examine the degradation of language and meaning in online environments. This exhibition, however, presents an oppositional and more precise paradigm of the language of artistic production today, one in which the artist mediates information that feeds back into itself, that reproduces and supports itself. It is an ecosystem of automated concept, production, and reading that replicates and subverts the role of the artist in the commercial gallery environment.